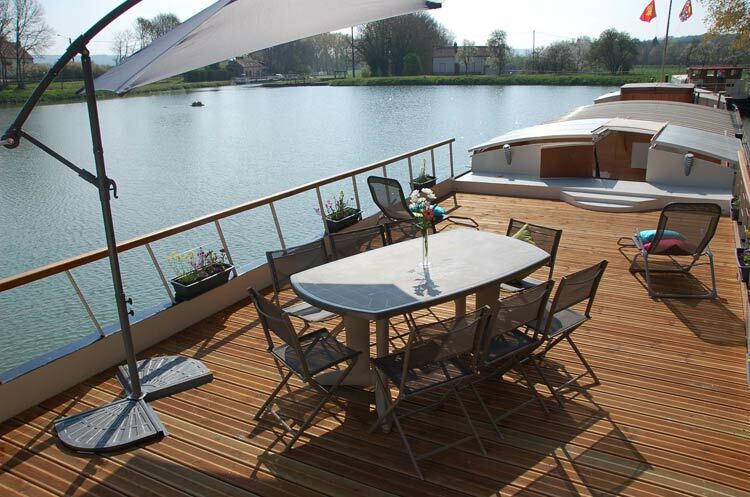 The Magnolia is a stunning barge with very spacious, light and modern accommodation. 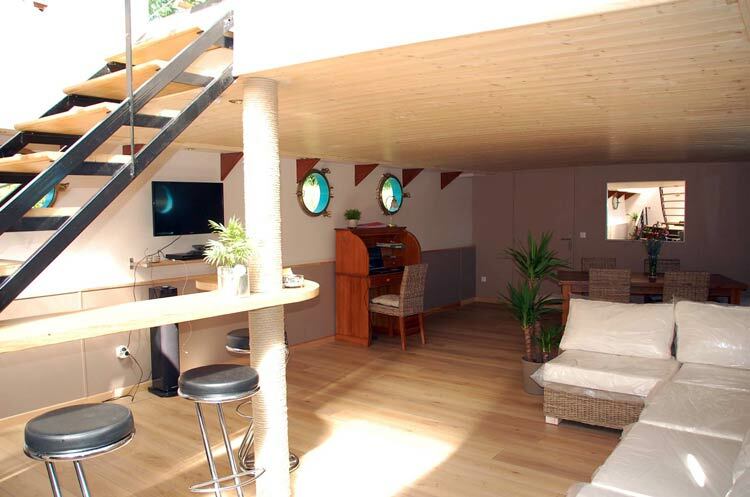 She is the only barge to offer three different charter types, to suit all needs and budgets, and can be chartered from as little as 6000€ for 6 people, for a 6 night stay! 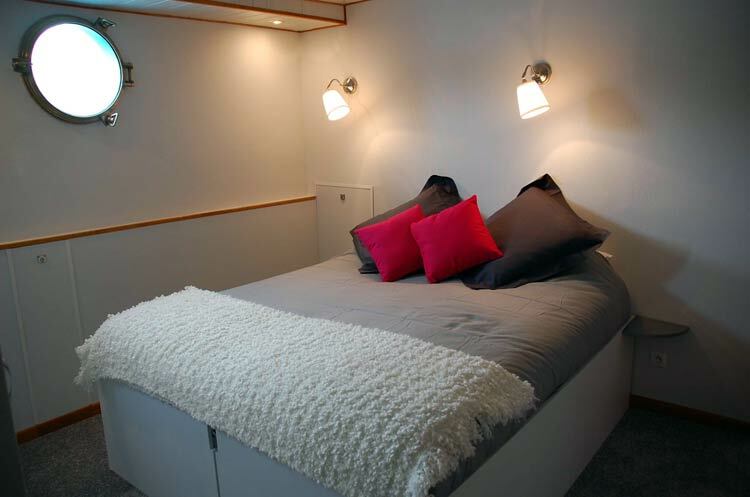 Specifically designed to give maximum privacy for up to 3 couples, there is plenty of space both above and below decks. As you step aboard, you’ll see two decks! 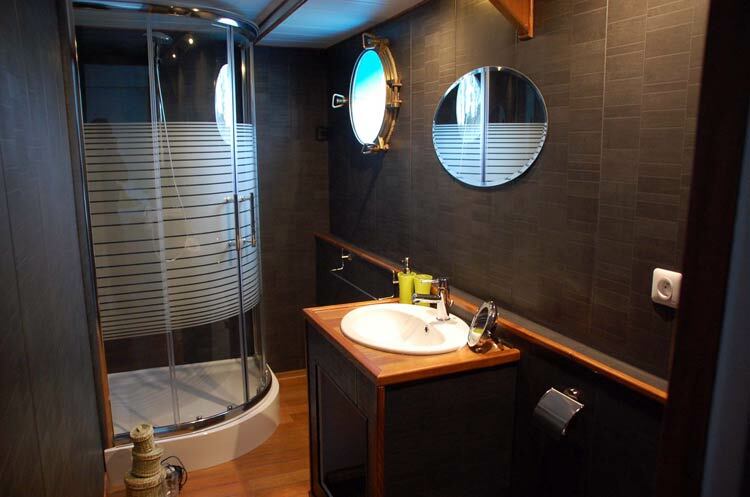 The main one has an outside kitchen, comfortable dining furniture and loungers, while the smaller one boasts a gorgeous hot tub just waiting to sooth your stress away.Below decks, relax in the huge saloon and make the most of the facilities including TV/DVD, WiFi and the I-pod deck. Three beautiful cabins with high-standing beds and exceptionally large ensuite bathrooms await you after a days cruising along the beautiful Burgundy canal. Your friendly hosts have many years of experience in the hotel barge industry, and will be delighted to introduce you to the beauty of the region, it’s history, monuments and of course, wonderful food and wines too. 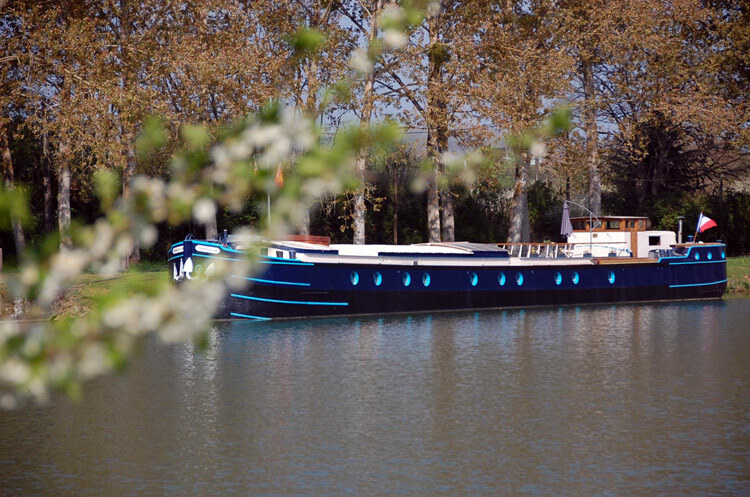 Whether you select a self-catering Home & Away vacation, a Half or Full board cruise, your skipper will look after the barge and take you on a magical journey along the Burgundy canal, between Dijon and Escommes. You will be met at Dijon TGV station at about 5pm, and then transfered to the barge moored in the nearby port. Enjoy a welcome drink on the deck, before setting in. This evening we will dine in a Dijon restaurant. The cruise begins crossing Lake Kir and then onward along the Burgundy canal. Today’s excursion is to the Clos du Vougeot, home of the wine headquarters where Cru are awarded. Wine was first made here by Monks many hundreds of years ago. See the vineyards and enjoy some wine tasting. After returning to the barge to freshen up, dine at the Petit Repere du Gout at Fleurey. Today is the chance to visit the wonderful town of Dijon and it’s colourful market. Explore this historic city, the capital of the Dukes of Burgundy, and it’s myriad of quaint streets in the old quarters. After the afternoon cruise, dine at the Abbaye de la Bussiere. The cruise takes you to Pont d’Ouche, a very pretty village. In the afternoon, an excursion to Beaune and it’s world famous Hospice. Cameras at the ready! This is a beautiful town and the Hospice itself is stunning. After a busy day there is a choice of dining between restaurants at nearby Sainte Sabine, Crugey and Bligny sur Ouche. Today’s cruise culminates at Chateauneuf en Auxois, one of the most beautiful villages in France. Perched high above the canal, enjoy the superb views of the valley and take a tour of the magnificent chateau. 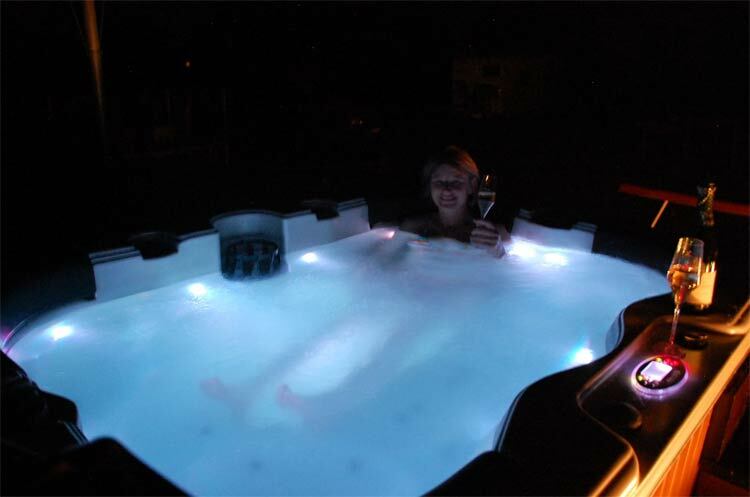 Back on board, why not take a dip in the hot tub before preparing to dine on board. This evening there will be ample time to look back on a wonderful week. After a hearty breakfast, depart to Dijon or Beaune for your onward journey. The above is a sample itinerary for those opting for the full board cruise. Those on the half board cruise will follow the same itinerary but with just breakfast and lunch included. The Home & Away vacation excludes all meals on board and excursions. Guests may use the professional galley and deck kitchen, or dine out, and may pay an additional supplement for excursions if required.